Mobile marketing involves initiatives that use mobile devices, such as smartphones and tablets, as platforms for marketing. From the use of beacons to mobile optimization for sites and email marketing, there are several tools and tactics to approach mobile marketing. Mobile coupons, mobile payments, loyalty apps, push notifications, and in-store geolocation technology are few types of mobile tactics or technologies used by the retail marketing industry in the U.S. to reach its audience. For marketers in the U.S., cost effectiveness is one of the key benefits of mobile advertising, along with its reach and immediacy. Mobile marketing is a promising field in the U.S. Not only the vast majority of marketers are somewhat satisfied with their mobile ads initiatives, but also around 64 percent of them said in 2015 that they expect to increase their mobile advertising budget over the next two years. The marketing industry in the U.S. is indeed projected to intensify investments in this area. 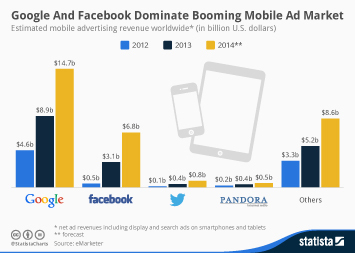 Mobile advertising spending in the U.S. is estimated to more than double between 2015 and 2019. Mobile video internet advertising is forecast to experience an aggressive growth in the coming years, with expectations to grow from 3.5 billion U.S. dollars in 2015 to 13.3 billion U.S. dollars in 2020. Retail, financial services, automotive and telecommunication are the biggest mobile advertising spenders; together, they account for about nearly 60 percent of mobile ad spend in the U.S. The effectiveness of mobile advertising is measured in different ways by marketers. Nearly half of marketers in the U.S. use sales to measure their mobile marketing success, while about 43 percent turn to social media shares and likes for that. Searches, application downloads, and texts or emails sent are also common metrics these marketers use to assess the success of their initiatives. Despite the rise of mobile marketing and its diverse uses, there are still challenges within this market. Marketers state that privacy is a major challenge in the mobile advertising industry in the U.S. The lack of standardized advertising units and agency expertise in mobile advertising are also mentioned as key challenges. About 50 percent of premium publishers, on the other hand, stated ad blockers are the primary mobile marketing challenge, followed by the quality of consumer experience.